For example: If my tiles are 12×12 and I want my niche to be two tiles high I will measure the exact dimension of two tiles high (with a grout line in the middle). You then want to ADD 1/4″ to that measurement. You can always build the tile out, you can’t make a tile fit into a space too small for it unless you cut it – then it will throw everything off. If my tile is 11 3/4″ square and I’m using a 1/8″ grout line then the inside dimension of my niche is going to be 23 7/8″ x 12″ (11 3/4 (tile) + 11 3/4 (tile) + 1/8 (grout line) + 1/4 (extra) high) X (11 3/4 (tile) + 1/4 (extra) wide). It looks confusing, it really isn’t. I will normally install my wall tile up to a row below where I want the niche. Once that’s finished I can draw level lines horizontally and vertically to determine exactly where my grout lines will be on the wall where the niche is being installed (or use a laser, ’cause I’m star-warsy like that…). Those lines are where the inside dimensions of your niche will be. 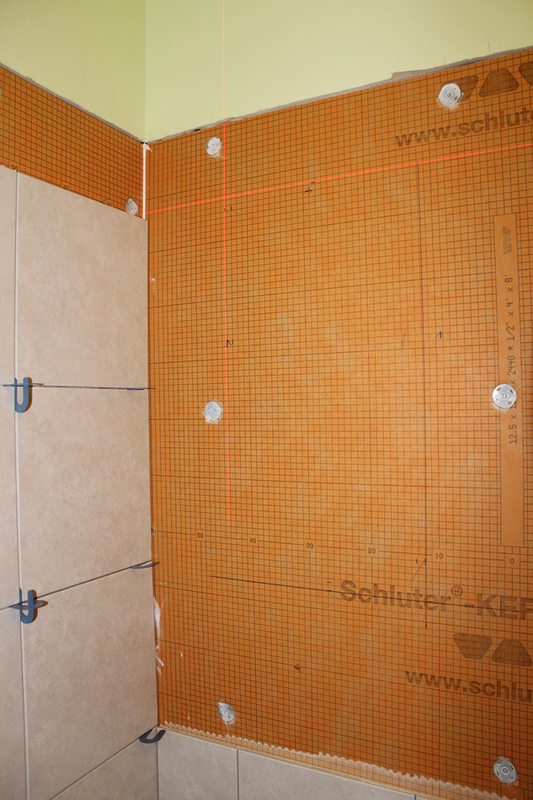 Using 1/2″ kerdi-board for your niche, you want to draw lines 1/2″ outside of your grout line markings. That way once you get your niche in there the inside dimensions will fall exactly on those grout lines. Now that I’ve completely confused the hell out of you I’ll walk you through it with pictures. It is important that you know where your wall studs are located! The niche must fit between two wall studs. I normally mark them directly onto the wall substrate as I am installing it. In some of the photos you’ll notice a random blue mark on the right side of where the niche will be, other than the marks I’m indicating – that is where that stud lays inside the wall. You need to ensure that you are inside these marks with your niche. You can click on any of these pictures for a full-size version. 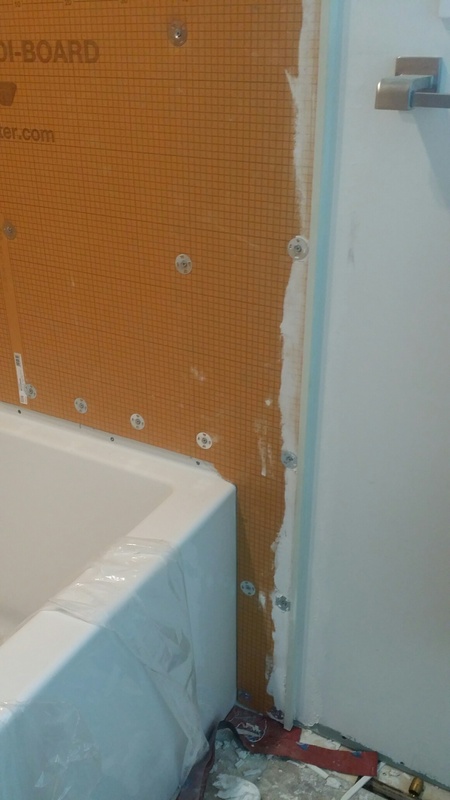 This particular shower uses kerdi-board for the wall substrate as well, but you can do this with a regular kerdi shower or any other substrate if you can seal the wall waterproofing to the kerdi-board niche. Kerdi-fix works for this with any topical waterproofing, liquids can be painted directly onto the niche. Traditional waterproofing with a barrier behind your substrate does not work with a kerdi-board niche. It can be done, but I really don’t recommend it. We begin with installation of the wall tile up to a row below the niche. This allows us to see exactly where the grout lines will be. Now we’ll shoot our laser lines (or draw level lines) from both the vertical grout line from the bottom and the horizontal grout line off the back wall. If you click on this picture you’ll notice a blue pen mark to the right of the vertical laser line (it’s near the crossing point on the bottom) and a mark 1/2″ below the horizontal grout line. 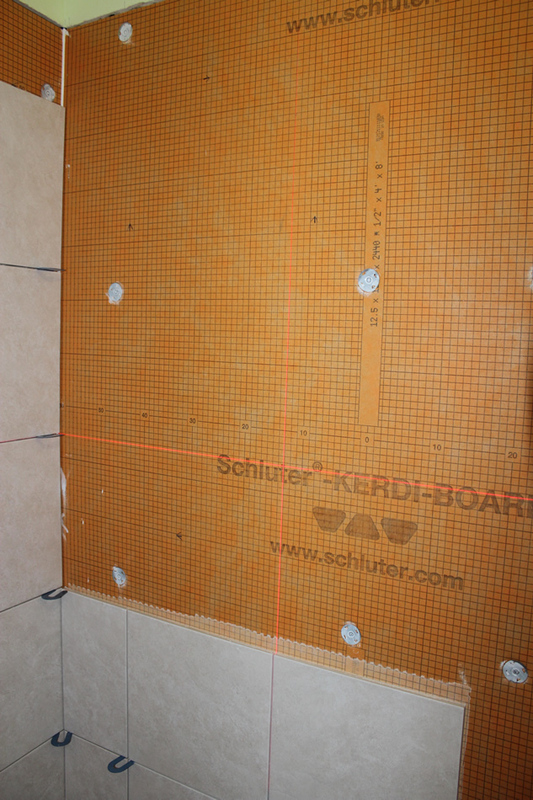 This mark is 1/2″ outside of the grout lines, that allows for the 1/2″ thickness of the kerdi-board in the niche. You want to draw a vertical line 1/2″ to the right of your grout line and 1/2″ under your bottom horizontal grout line all the way up past the top of your niche and all the way across the bottom. You are drawing lines to indicate where the outside of your niche can be and still meet up with the grout lines. Now line up the laser (or level lines) with the grout lines on the left side of the niche and the top of the niche. Make your 1/2″ marks outside of those and draw those two lines. 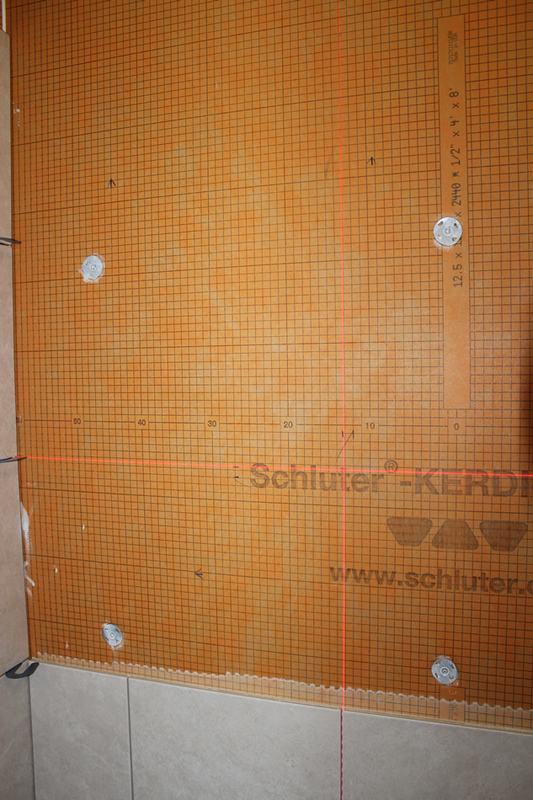 In this photo the laser is lined up with those marks 1/2″ away from the grout lines. Now hold your pre-made niche up there and make sure the perimeter is outside the lines that you just marked – the ones that are 1/2″ outside the grout lines. Trace the outside of the niche onto the wall substrate. These will be the lines that you cut to create the space for your niche. Then cut out the rectangle that you just traced around your niche. Once you have the hole cut out place your niche in there about half way to ensure that the perimeter is big enough and it fits snugly. Now you want to cut a 2×4 for both the top and bottom of the niche. 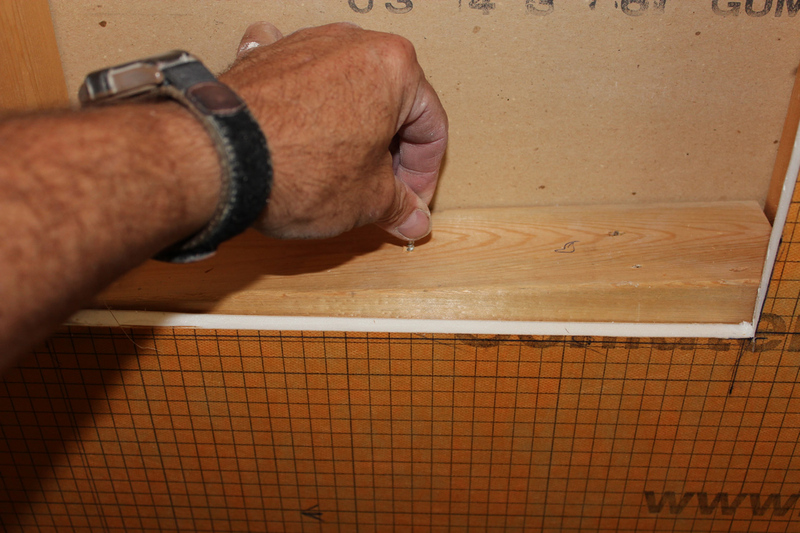 Measure between the studs for each – they may not be the same size (depending on how consistent your wall studs are). 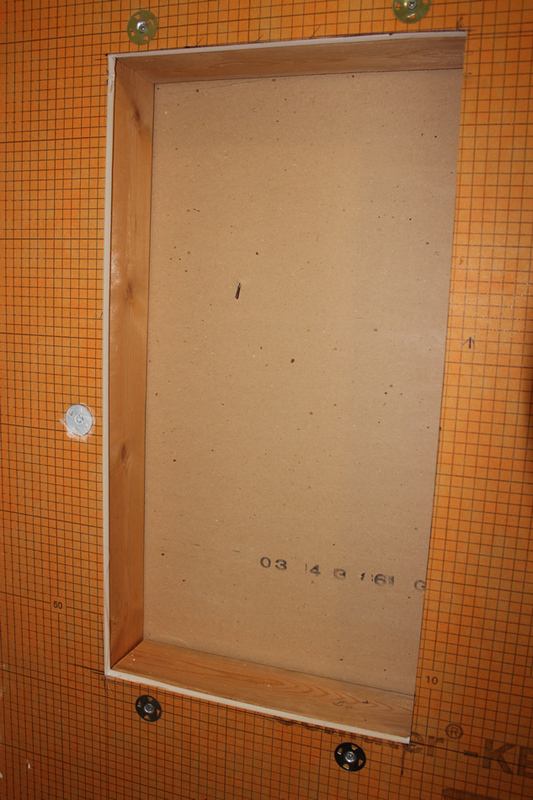 Place the 2×4’s in there and tap them in so they are flush with the top and bottom of the opening in your wall. 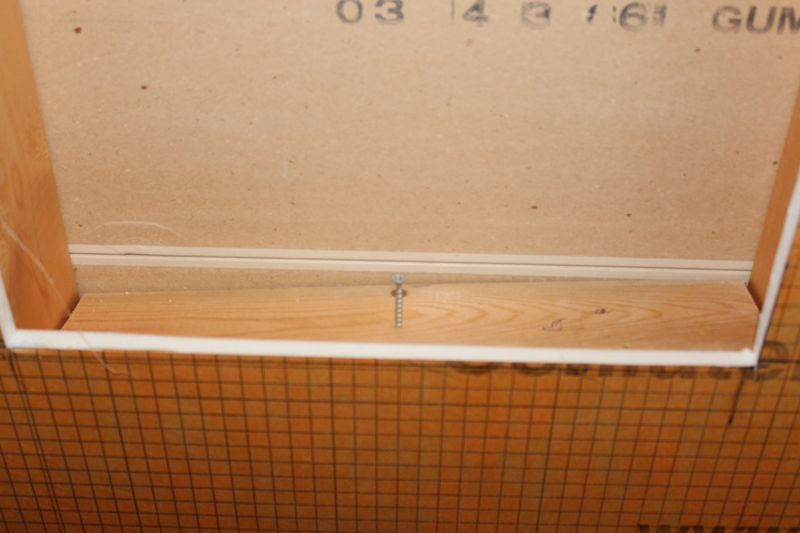 Place two screws on the top and two on the bottom through your wall substrate to hold them into place. You can see the screws and washers holding the 2x4s on the top and bottom in the second photo below. If you happen to push the bottom 2×4 too far down (that NEVER happens to me…) you can simply drive a screw into the center of it and pull it back up. Don’t tear your wall apart because it went down too far. Now push your niche into the opening. You can use screws into the sides to secure it, kerdi-fix on the back of the niche will hold it in place as well. Once you get it in there it should be snug and unable to move around. Once it’s all flush and snug finish waterproofing the transition from the wall substrate to the niche box, in this case I used kerdi-fix, and let it cure (it is NOT installed yet in this photo!). If you’re using regular kerdi, kerdi-fix will work as does a band of kerdi over the edges. If using a liquid membrane simply paint it over the edge at least two inches into the niche and out onto your wall substrate. That’s it. Now it’s all ready for tile. Provided you placed and cut everything correctly the inside edges of your niche should be about 1/8″ outside your grout lines. With thinset beneath the tile inside the niche it should line up perfectly. 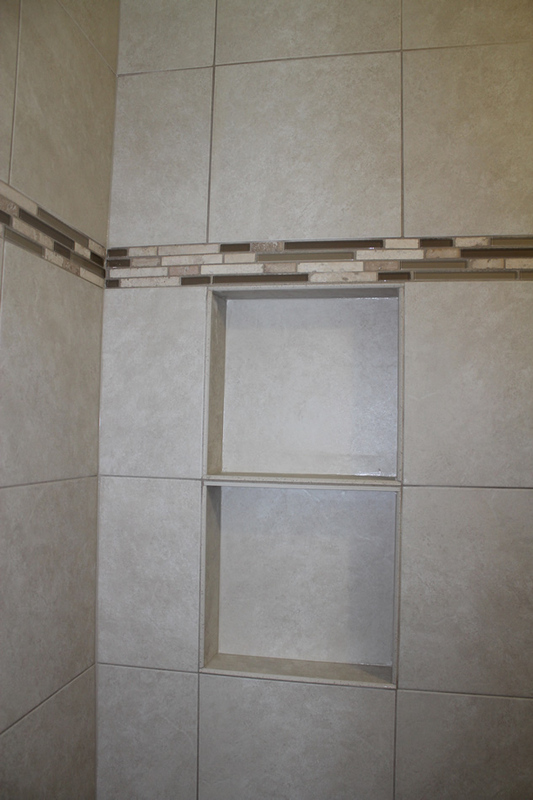 You can read about how I install tile into the niche here: Building a niche for your shower Part 4. It’s all the same thing – a box inside your wall. 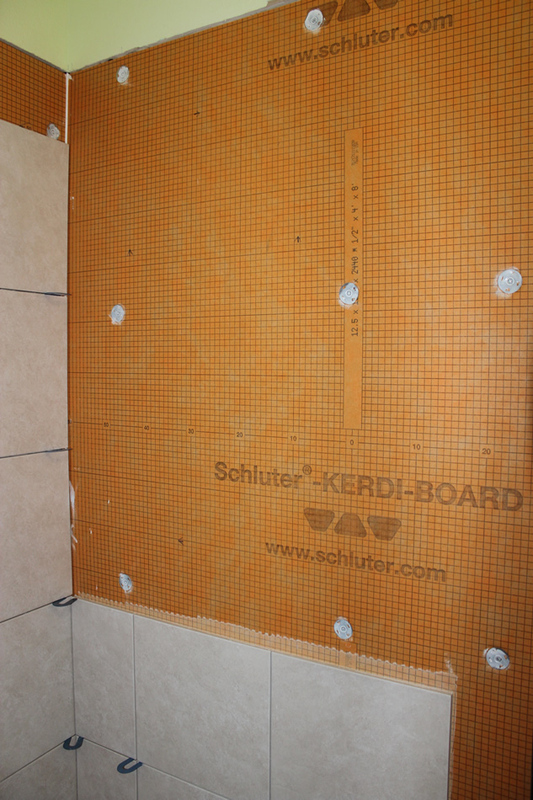 The tile is installed the same way whether you use kerdi-board, regular kerdi, liquid waterproofing like hydroban, etc. I’ll leave you alone now since you have to go scrub kerdi-fix off of everything – again. I have a couple of questions. I have installed kerdi board before and used a factory built niche. It worked fine. In the bathroom I am re-doing now, the Niche would be located on an exterior wall with insulation. 1. How do I deal with the insulation? Do I move it out and put in “high R insulation? vertical studs work (with no horizontal ones? Yes, the high R insulation is best. Actually, not having a niche on an exterior wall is best, but I live in the real world as well. You need to have at least one horizontal stud for the bottom, since that is the piece that will have all the weight and pressure on it once tiled. It can’t be floating in the air. Yes, you can put the kerdi-board up then cut it after you begin installing – that’s how I do it. I place a loose stud between the studs where the niche will be, around where the middle height will be, then install the board over that. Once you cut out the wall for your niche tap that loose stud down where it needs to be for the bottom of the niche, then screw it through the kerdi-board to hold it in place. I have that very one and can tell you it seems very good structurally, but because it’s desighned for a 2×4 wall , it’s 3-1/2” deep. I decided I really wanted a deeper niche , so I followed the directions here . Yes, and I don’t like them. I don’t like any premade niches, they never line up EXACTLY with the installation. My fabricated niches do, because I build them specifically for that purpose. But they do work just fine as far as function. Here is my alcove wall . I used the Kerdi fix to seal it around the perimeter. There is Kerdi fix on the joints of the niche , but you can’t really see it . I seal all of mine with just kerdi-fix. It works fine. I do bond everything together with kerdi-fix, then, once installed, I also kerdi-fix all the seams once again just like I would if I were siliconing the finished installation. Thank you . I was hoping to use only the Kerdi fix. That stuff is unreal, about as sticky as it gets . Can’t we why it would leak with only the Kerdi fix . Dang , I wish I could get pic to load . I chose a file , it went to my iPads gallery , and hit submit . Typically there is a time to load . Not what the heck I’m doing wrong . I should have mentioned , I have my Kerdi board tight against the front sides of the tub . I’m thinking it’s to tight , and that maybe I should put a metal square against the tub side and slice out a sliver of Kerdi board , making room for some Kerdi fix . Or just be lazy and spread some where the Kerdi board and tub meet? Wish I could delete mistakes .heres a pic of where the Kerdi meets the tub side . This is where I’m trying to decide whether I should cut some Kerdi board out to make room for Kerdi fix . I’m assuming you silicone the tile where it meets the tub when your done anyways , so maybe it’s no big deal . It’s all good Rick, I can see it when you just type the url in the comment. The niche is fine the way it is. I also wouldn’t worry about the k-board butted up to the tub, the foam is a hell of a lot more forgiving with expansion. Thanks for the replies Roger . I have a real bad feeling about the tiling part . I have an outlet above the niche also . It’s low voltage though , 24V ac, to power a fogless mirror . I may be over my head, but seeing as you can tile as much as you can muster at once , and then carry on another day , hopefully with patience, this will turn out . If all else fails , it’s a tear down and acrylic sides . I want to incorporate Shluter profiles on the niches leading edges . I have a metal Miter saw . Hopefully this doesn’t throw a wrench into things . I’m putting a piece of MDF to displace the tile on the bottom row . This way I’m starting from the second row up , which will be at the bottom of the niche . Hoping it will be a better strategy. I do have a Dewalt laser levelling system , and found it’s came in handy already. It’s either this or pay the locals $1500 to do it right the first time lol . I have built a simular niche out of Kerdi board . Used Kerdi fix to bond it together . Now I’m wondering if all the inside joints of the niche should have Kerdi tape on them embedded with thin set mortar ? Roger, I’ve read four of your books. Much helpful information for a novice like myself . I’m still undecided on where I’m going to install the niche. The space between the studs in this wall is 13 5/8”, and it’s 3 3/8” deep. My tile is 11 13/16” x ¼”inch thick. I’ve read about another tile installer who installs his niche in the corner to avoid the skinny tile. I’m thinking about doing it that way. What do you think? I’d have to move the corner stud to do so, but I don’t foresee a problem. Also, in Tile Tips 2, you mentioned that you use a $60 laser level. It looks like a Black & Decker. Which model is it? Does it make sense (is it even possible?) 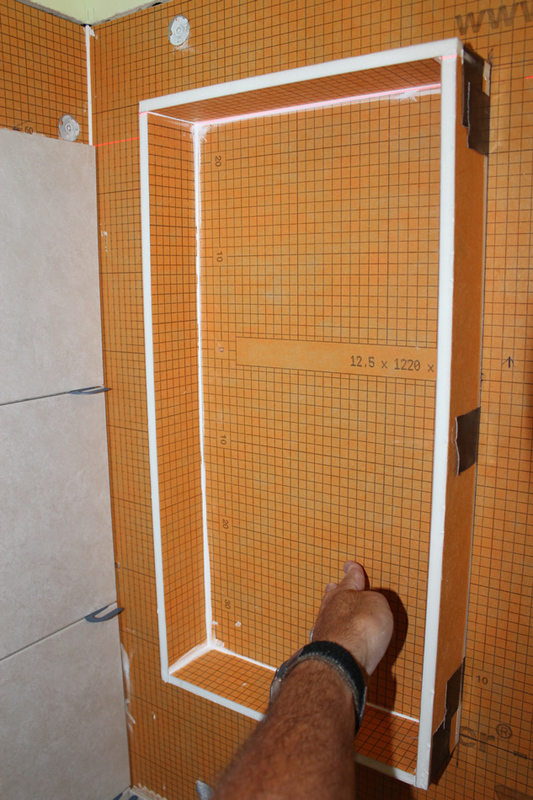 to build a 38″ x 38″ Neo Angle shower using Kerdi membrane on the walls and by cutting to size a 48″ x 48″ Kerdi pan? In other words, what is the best way to do a Kerdi shower if you need to build a Neo Angle shower? I’m sure that building the pan correctly is a must do. Love your site – SO informative! Could you build a niche out of densshield? If so, would you still need a liquid waterproof membrane on top since the densshield has it built in? Or could you just use silicone, tape and mud the edges? Yes you can. And no, you don’t need a liquid, just the silicone, etc. I built and installed Kerdi board niches in wall, on layout :). 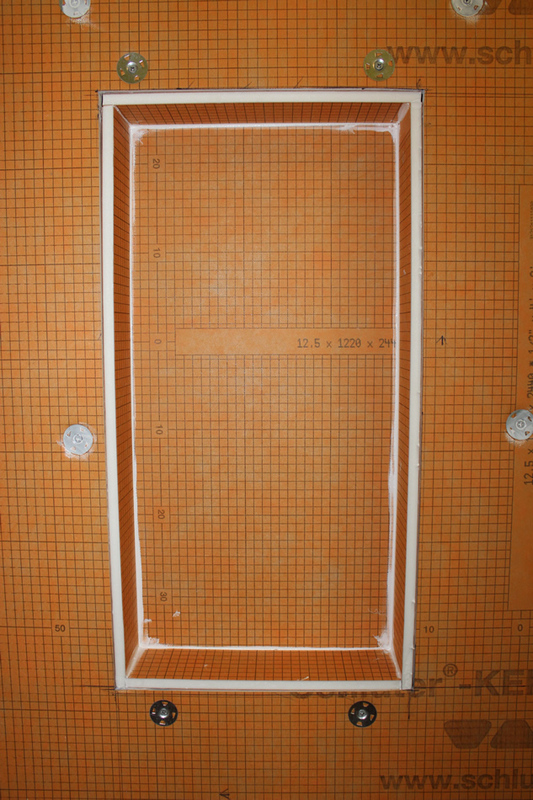 I just used Kerdi membrane on my walls and cut out the membrane flush with the niches. So the very edge of the niche, where it meets the membrane, needs waterproofing. What do you recommend: Kerdi fix or Kerdi band for those 90 deg edges where niche meets wall with Kerdi membrane? Ahhh, forget it. I used Kerdi band. Think I gott’er…you can take this one off. You need to use kerdi-band on all those edges in order to get the 2″ overlap required on the kerdi. Roger- I am having trouble with a pre-fab Schluter niche. 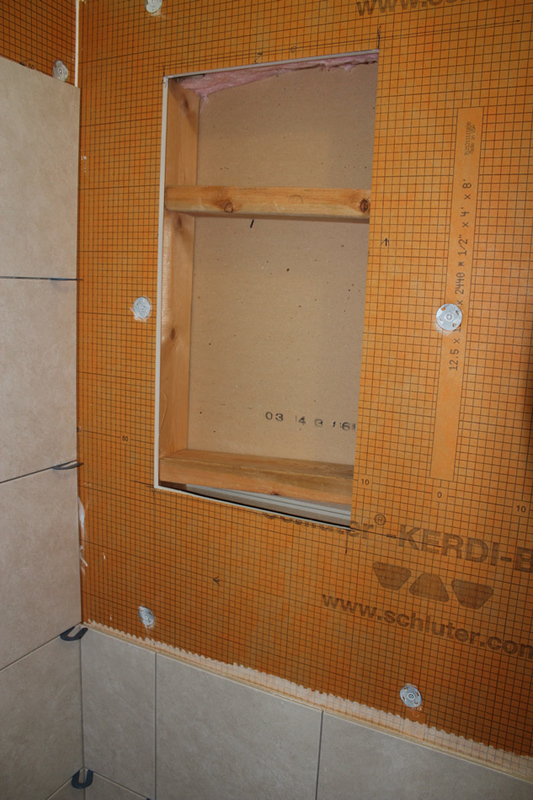 The niche is in the back shower wall which required two pieces of Kerdi to cover. I lapped them by 3 inches. I covered the right side of the wall and the niche with the 2nd (top) piece of Kerdi and then cut it out with a utility knife after smoothing the sheet and Kerrabond underneath. 8 hours later the Kerdi was affixed to the drywall substrate with excellent coverage but did not seem to bond to the pre-fab Kerdi niche flanges. 1) any thoughts on why this occurred? 2) I pulled the 2nd sheet off the wall and scraped remaining thin set. Do you think I can put up a new piece and try again or have I damaged the fleece of the first sheet by removing the lapped sheet? 1. Thinset too dry? Skimmed over? Not embedded well? Could be a number of things. 2. Unless it was bonded (which it obviously wasn’t) then the fleece should be fine. You can go head and install a new piece. I am really struggling with my niches and tile layout. The wall tile I will be using measures 11 7/8. I agree that it looks better if the niches lineup with the grout line. Is this why people tend to run the glass accents at the top of the niche, to make up the additional space? 1. If I were to line up the top and bottom grout line that makes my niches only 11/7/8 high right? By the time I put the tile on the inside they will only be 10.5 or so. Am I missing something? 2. Can I upload an image showing my possible tile layouts so that you can see them and give me advice on what is the right direction to head. 3. I am using cement board to line the niches and there are gaps between the seams. (some rather large because I initially cut it to use the plastic redi niche inserts.) Can I confidently fill those gaps with thinset and fiberglass tape and then redgard? Should I try to put Kerdi band over the seams or???? 4. I want to line my niches with the schluter trim Quadec I think. Do I need to factor any additional measuments or space in, to determine what size to make my niches? Whewww… Thanks for all of your help and patience. I have no idea if that’s why people do that – it isn’t why I do it. 1. Yes, minus the thickness of the tile x 2 to account for the top and bottom of the niche. 2. Yes, but it may take a bit. I’m out of town until next thursday. 4. No, the quadec edges should be the same thickness of your tile, so the measurements should be the same. Maybe there is a reason why the inside tiles of the niche edge is showing? How big of a gap would the redgard fill worse case scenario? Lastly I assume the redgard should extend all the way down to the bottom of the cement board and meet my pre-slope. No reason at all not to do that – if you like the look of it. I don’t, that’s why I don’t do it. No rule against it, though. 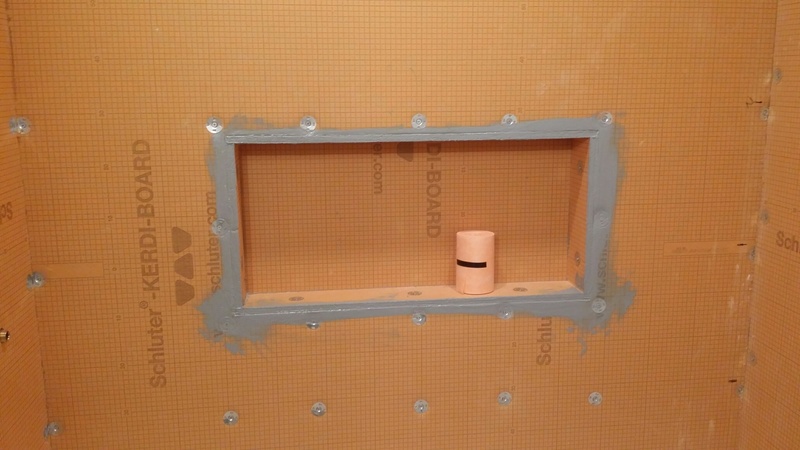 If your gap is larger than 1/16″ or so fill it with silicone first, or tape and mud it, then redgard. Yes, the redgard should run all the way down the wall. I have a basement washroom that was already finished but now I would like to add a shower. I would like to use the Kerdi system. I know I can use the Kerdi over drywall but what about a finished wall (dry wall mud, tape and painted) ? is there anything special I have to do? You can as long as you sand the paint to ensure you have a rough surface for your thinset to bond to. Greetings and salutations! Thank you for revealing some secrets from the workshop. I am a musician, which means I have to have a second job to pay all of my bills. I’d preferably be a full-time finish carpenter, but would starve around here doing that for my second job. So I am a handyman doing all sorts of odd jobs hence the name Oddjob (Also stolen from the James Bond film Goldfinger). I have taken on a bathroom/closet remodel and have a few questions for you that I haven’t found answers to on your pages as of yet. Most of them revolve around ideas presented in your Fort Collins/Glass Block project so I am replying here. My project was originally going to include a steam shower with a 40” x 72” glass block window. They dropped the steam shower (because I installed a jetted tub with re-heater) and opted instead for an open shower with a curved (turned) glass block wall. When I knocked down the wall I had framed I just left the sill (now a curb) at 10” and continued it around to the entrance curb accommodating the glass block dimensions before dropping down to my three 2×4’s stacked. I installed HardieBacker 500 on both sides (after my pan liner) and the top then taped and mudded my seams with thin-set. I used RedGard on my walls from 6” above my shower heads down to and up and over my wall curb and a couple inches down the outside wall (something about not trusting a plastic moisture barrier to protect my wall studs from soggy cement board when I could just keep the cement board from getting soggy in the first place). I used Kirb-Perfect for my actual curb. I see you have three 2×4’s on edge, giving you a super solid wider surface for your wall. I’d be jealous if I didn’t have a double 2×4 top plate with 12” o.c. spaced mini-studs (wide open there) supporting my wall (I like to over-engineer everything too). I ripped down bull-nosed tile to set back-to-back to top the wall curb. I might have liked to have known about that edge trim you used but probably not on a curb that high. My first question has to do with the cement board covering your curb. It doesn’t appear that you taped and mudded your seams probably because you were covering them with membrane (which you seem to like…a lot). Secondly, how do you get your cement board to break that cleanly? Your pieces look like they fit real tightly. I could do that with wood but maybe I lack the proper tools with HardieBacker? Your floor tile also fit snug. I scribe mine and remove any large sections with straight cuts on the wet saw and then cut fingers and knock them out and then use my wet saw to “grind” to my line. Even so, it looked like your cuts were better. How do you do that? My next questions are about the glass block wall installation. I was originally going to go with a silicone construction (anchoring every second course) a la ProVantage style and finish with urethane grout. In your project you didn’t mention your installation method. Also, you used Arque blocks which, I believe, are Pittsburgh Corning products but I was looking for a tighter radius and ended up with AllBend, which are a Weck product. A glass block guy told me that you could use the ProVantage with the Weck block except for the AllBend but because the Weck are finished white on the sides I could make wedges for the AllBend to set the wall. He said he would use mortar instead. Silicone or mortar? Urethane or epoxy grout? I think I saw a Canadian company advertising 40 colors of tile/glass inserts for 8” glass block but it looks like you made your own from the field tile. Did you bevel cut the tile or straight cut it? Also, why white for the glass block joints? Don’t get me wrong, much respect for your trade. I can plug, patch, fill and paint wood but you can’t hide your blemishes…I was curious why you didn’t color-match it, that’s all. I also installed radiant floor heating. I used the Laticrete system and they said it couldn’t be installed in a shower floor. I would suppose that must be true for a conventional liner and mud pan install. I am assuming you installed electric as I did, from your reference to “element”, but since you used a fabric pan application method; this must isolate your electric from the water? Man, a heated shower floor would have been awesome. My next questions are tool related. As I stated earlier, I am a handyman/remodeler (what do you know, that isn’t a word), so I’ve only done about 30 tile jobs (about two per year). My first ones were using a wheel cutter, rope saw, nippers and a ceramic file. I got fed up with the wasted materials dealing with the wheel cutter and bought a QEP 7” model 60089. I liked being able to control my cuts like a table saw, but it was messy. Then I got a large job and could afford a “pro” wet saw so I bought an MK-101. I think you said it was called the “Red Screamer”. It seemed even better (more power easily cutting larger tiles) with the sliding table and removable catch tray, reminding me of a radial arm saw…only opposite. It is still messy though. I kept the QEP not knowing quite why, but I still use it to cut odd bevels because it has a tilting table. The “manual” wheel cutter was also a QEP which probably explains why I hated it so much. Using a wet saw outside in this weather is complicated. I froze up the other day and was considering RV antifreeze but was worried about damage to my pump and/or saw. Do you have advice on this? In your “mosaic” page you mentioned your Sigma but that was all. After reading other internet ramblings I have come to the conclusion that since most of my cuts are straight (not always square, old houses never are) I would benefit from a “real” cutter. I was lusting after the Sigma 2A3 but don’t know if that model accepts the mosaic kit. I also saw they make wet saws, but everybody seems to like the wheel cutters they make. I was wondering which one(s) you have and how often you replace wheels and blades (average job life expectancy)? I have a spiral saw that I use tile bits in, but the cost of the bits seems high for their life expectancy. I have a 4” angle grinder I use for some shaping but I have only used cement/masonry blades in it. I never really thought of looking for a diamond blade to fit it. I also saw on the Sigma site that their grinder attachment for their polishing wheels has a reversed retaining nut so they can used the full face. Have you used that item before? Opinions? I am also wondering what gloves are best suited to working with tile and thinset? Still trying to protect my musician hands. It has the same picture because I’m the same guy. I don’t, however, have any idea to which picture you may be referring. The curb trim is schluter, they have many different ones. That is correct, I did not tape and mud because I used kerdi over it. It does the same thing. That particular backer is fiberboard, not hardi, it breaks more cleanly. I make most of my curved cuts with a grinder. If I have the right tile I can also do it on my sigma. I did use arque. They were anchored to the wall and all set with mortar. I used regular cementitious glass block grout. You can not use epoxy on a full block wall, it won’t bond to the glass due to the extreme expansion and contraction on a full wall of glass. The tile on the glass are all beveled. I used white because that’s what my customer wanted. The heating element is suntouch. They are plastic coated and approved for use in wet areas such as shower floors. It needs to be rated for that use whether or not you have a membrane covering it. If you get the ‘green’, environmentally friendly antifreeze it will not damage your saw or pump. It works well, as does a wet saw water heater. A real snap cutter is a completely different tool than a qep model. My sigma had to be ordered from Italy, but it was worth every penny – actually, to me, it’s worth more than double the money I paid for it.I have the 2D3 (push) model. I replace the wheel about every 18 months, but did every six months or so until I got used to how it really worked and how much pressure I needed on it. I was forcing it when it doesn’t really need to be. You can get a mosaic mat and cut mosaics on any model sigma. They used to have a mosaic specific model but discontinued it. Go to amazon and order a ‘zipper tile blade’ for your grinder. You’ll be amazed. I have not used any of the sigma polishing equipment, I do mine dry. I just discovered that your pages “randomize” the upper right photo. So who knows when that picture would appear at precisely the moment you are looking for it? Obviously you figured out that I was referring to the open shower/linear drain and open-ended glass block walls…pinwheel pattern on the floor. Anyway, thanks. I found Zipper Pro blades. The 10 inch that would fit my wet saw is 3X what I paid for the DeWalt blade I am using now. Is it worth that difference in price? I AM saving $50 up for the grinder blade though. How long might I expect it to last? I know, “How are you going to use it?”. I have had my grinder since the 1980’s, if that tells you how well I like to take care of my equipment. So would you say you make around 90% of you cuts with either your Sigma or grinder and only about 10% on your wet saw? Also, you didn’t say what your preferred wet saw is. And which gloves are best. So I am going to go with glass block mortar to set my block, anchoring to my vertical side as I go. So I need the reinforcing wire in my anchor courses, right? And then urethane grout, Laticrete if I can find it, for the color. Seems Lowe’s (closest big box, though I can get to a Home Depot with an extra 1 1/2 round trip) doesn’t want to carry it anymore because TEC allows a higher profit margin. I really like Laticrete products. What tool did you use for beveling the tile inserts in your glass block? I am also saving for a Sigma. The 2A3 will handle all the sizes I have ever done before and I found a place where I can get one for $240. Does that seem like a pretty good deal and place to start? Sorry…that would be 90% of YOUR cuts…not you cuts. Yes, it is worth the difference in price. I change my wet saw blade about once a year, depending on how much stone I do. When I said 90 percent of my cuts I was referring to ceramic or porcelain, all natural stone needs to be cut on the saw. Grinder blade is changed about every six months. Missed the glove question in your last novel. With glass block I use the gloves with the rubber palm and fingers and cloth on the back. Plumbers use them. I have seven wet saws, the one that is always in my truck, and on most jobsites, is my dewalt (one of my dewalts, anyway). Yes, you need wire in every course. I used my dewalt for the beveling. That is a very good deal on the sigma. One more thing on the glass block wall…when you set your bed for the 1st course, do you have to do anything special to the tile on top of the curb for the glass block mortar to stick? Or is it held in place mostly by the urethane grout? It’s held in place by the mortar. I don’t do anything special to the tile beneath the first course, but you can scarify it if you want for a better grab. As usual, the best, easiest to understand and simple way to do anything related to tile. Thanks. I’ve found the kerdi board but the sales person said to use screws topped with a bit of silicone to hold the board to the studs. What are the wide silver (they look like washers ) holding your kerdi board to the wall? They are the kerdi-board washers. You need the washers to distribute the pressure over a larger area than just the head of the screw – it will not hold it firmly enough. Awesome post. Question about preformed niches like TileRedy and such. What are your thoughts on those? We are using one for our first every bathroom rebuild because we’re going for simplicity of install, but are they going to last as well as a custom build like this? Thanks. Yes, it will last. They work just fine and hold up just as well. However, I don’t use them because they NEVER line up properly with the grout lines. That is the reason I build all mine from scratch. The pre-made ones are much easier and quicker (although not much then kerdi-board), but they are also more expensive. Agreed about the grout lines. Thanks! One should not read this until their hangover has sufficiently passed. My head hurts even more now.